What she can’t handle is the vision. Over and over, Jules sees a careening truck hit a building and explode... and nine body bags in the snow. She has no idea why this is happening to her or if she’s going crazy. It hardly matters, because the visions are everywhere--on billboards, television screens, windows--and she’s the only one who can see them. Ahhh! Did you read that summary? This book sounds like it will be amazing. I LOVE Lisa McMann, she's such a great writer. I am really looking forward to reading more of her work! Looks very good and the cover is stunning! Lisa McMann is a genius so I will most definitely read this!! I think this sounds really good, kind of like Wake. Good pick! OOh interesting! Seeing this around lately and I am getting intrigued! I am BEYOND excited for this one! I love Lisa's books so much! I didn't even know this was comnig out. It sounds amazing and I did enjoy Dead To You so hopefully this one is just as great. Ooh I loved Lisa McMann's Wake trilogy! This one sounds awesome, thanks for sharing! Definitely excited for this one! I really like the focus on the eye and the fires within. Plus, I do adore Lisa! Oh, the close-up on the eye is so creepy to me (and this cover kind of reminds me of some other covers too). Saying that, I like the sound of the synopsis and I've been wanting to give McMann's writing a try. Putting this on my TBR list! Great choice! Hi Christy, first time visitor stopping by from Goodreads. Great to meet you! 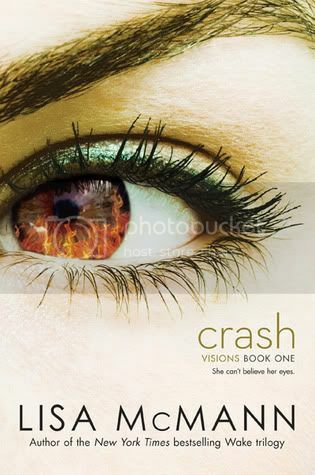 And good luck to Lisa and her book Crash! This is wonderful! I haven't even heard about this one before, but am definitely very excited - it's Lisa MacMann after all! :) Thank you for spotlighting it! Already added to my TBR!